Some of the pictures qualities are not good. Sunday, 3rd of July 2011. The race started around 7:15am and it was a very very hot day. The participations were huge partly because of the prizes. The organizer made it compulsory to wear the event t-shirt (it was a cotton t-shirt not a dri-fit), so if you sweat a lot or pour water on it, it becomes heavier. I saw a few cyclists on that day turn up and becomes a runner. Well done guys !!! My running was really bad on that day. I was running at a pace around 6:15min/km. Slow running. A bit tired, no energy and the fitness is not that well………up to the standard. Even though I’m slow, I didn’t stop running. I just keep on running. These 2 guys managed to beat me. They overtake me at Istana Edinburg. 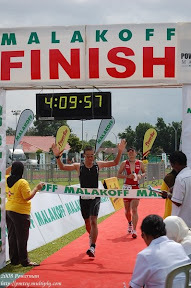 Wajdi managed to clocked 55 mins, Huzaimi 56 mins and I got 58 mins. I was happy that I managed to finish 10km run under 60 mins walaupun dengan fitness yang inda seberapa. My brother, Aliuddin, he registered for the run but decided to take pictures.